Modern Look with Roman Shades - by Exciting Windows! Goblet pleat custom side panels with decorative holdback arms. 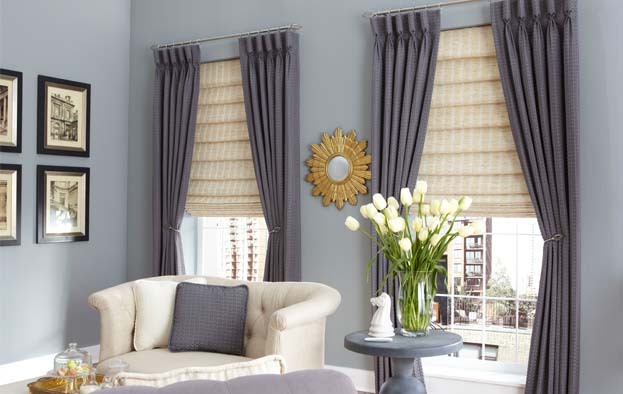 Chic hobbled roman shades with organic woven texture. Balanced fabric color selection for complete room coordination. If you desire a modern, understated look, this is your room. These simple window treatments add color and texture without stealing the show. The fabric selection captures the room?s complete color palette and coordinates perfectly with the home furnishings. Lastly, a toss pillow made from the same fabric as the drapes pulls the room together even more. Let us help you personalize any room in your home!